See the added image below the photo of Victor below. I generally do not modify published posts, except with self-deprecating cross-outs. But here I’m adding the “plans” sent along by William Lafferty that clearly show the “mis-read” of the 1911 caption writer. Here was a link I had intended to put with this post as well. A further contradiction of the “misread” of the orientation of the boat is provided by the rake of the masts. Thanks all for your corrections; contemporary captions on any archival photos can be wrong. So this one is a mystery, and it deepens when you find there is Inspector I and Inspector II, and I don’t know which this is. This photo is identified as taken in 1919 or 1920, but since the only person identified is Governor Miller, I’m thinking the photo was taken in 1921 or 1922. My questions: Is this the yacht built by Consolidated in 1909, 80′ loa? Are there photos of Governor FD Roosevelt using it? Did it once belong to a Rochester NY radio station? Does anyone have facts about it being used in the Mariel Boatlift and ultimately sinking in the Caribbean? 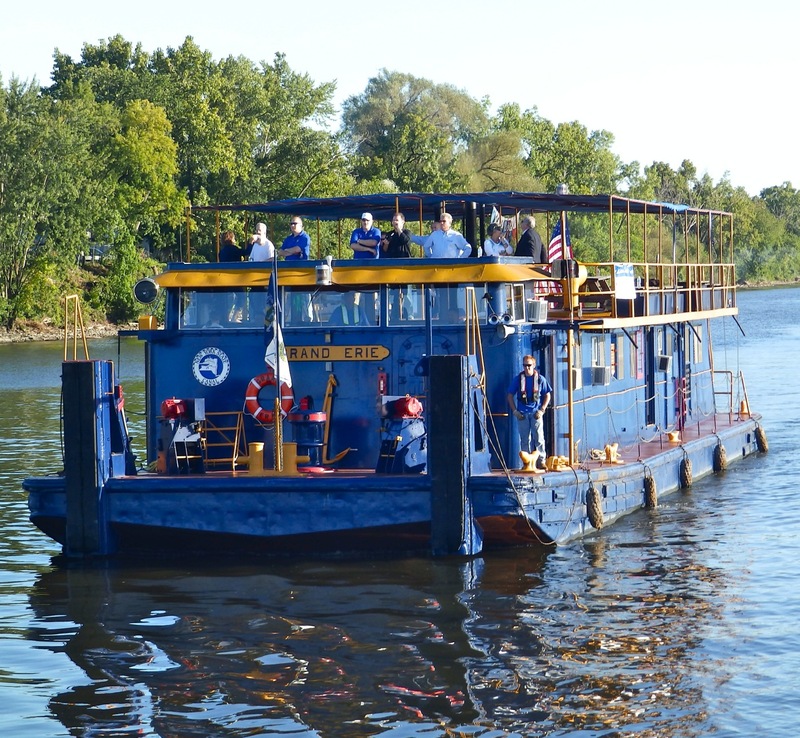 Today there are still annual canal inspections, but one of the vessels used is Grand Erie, a very different creature. The photo above was taken by Will Van Dorp, who’s eager to learn the rest of the story of motor yacht Inspector. 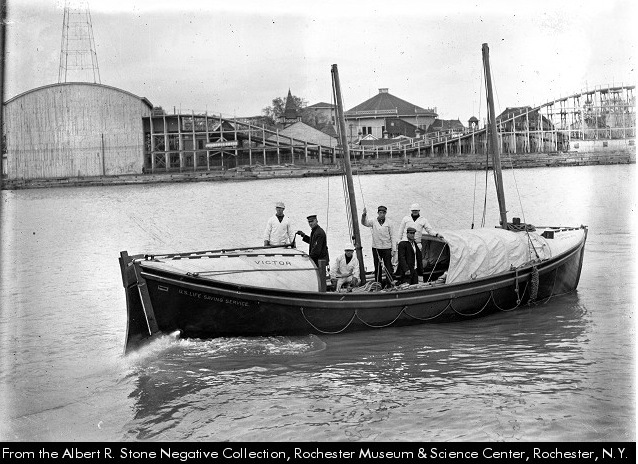 The first photograph is a nice image of a 36-foot McLellan Type E motor lifeboat, one of 36 such craft built for the United States Life Saving Service by the Electric Launch Company of Bayonne between 1908 and 1915, and the first motorized craft built for the service (although some pulling boats, especially the Merryman 34-foot models, had been converted to gasoline power before the appearance of the McLellan Type E). A 6-cylinder Holmes “Automarine” 40-bhp gasoline engine provided propulsion, constructed ay Mystic, Connecticut, although the boat was also equipped with sails for its two masts and thwarts for ten oars. That is the Consolidated-built Inspector in the other photographs. 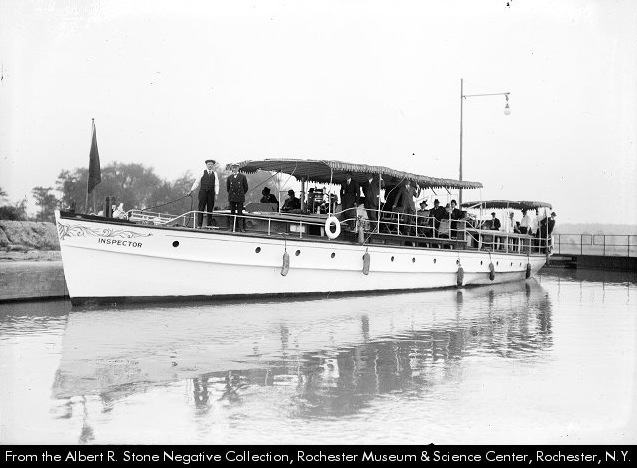 A second Inspector, Inspector II, was originally the yacht built in 1925 at New York by the New York Yacht, Launch and Engine Company for George Bourne, president of the Superheater Company, as Onwego and later Nancy III. I believe the Canal Corporation had an earlier Inspector II, as well, in the teens. That vessel was, indeed, owned by Rust Broadcasting Company, which acquired that town’s clear-channel radio station WHAM in 1962. I believe the vessel ended up at West Palm Beach, Florida in the 1970s. The Inspector II does appear to be the vessel that sank 29 July 1980 in the Florida Straits with 160 Cubans aboard (all saved) when its bilge pump stopped operating. Bill– Thx much for all this info. A reader wrote this: “Methinks the description is wrong about the relative positions of the canvas covered & decked ends or that boat has it’s rudder & exhaust in the bow and it’s backing down…highly unlikely even though the captain/helmsman is facing the decked end. Then again, I’d want the decked over end in the bow and the canvas in the stern like it says. The location of the name only adds to the puzzle.” When I decided to use the text from the collection, I hesitated briefly at this part: “decking in the bow and canvas covering a sheltered space in the stern.” The decked end is the end with the rudder . . . making it the stern, not the bow. ?? The engine exhaust is discharging just forward of the rudder. This is clearly the aft end. Let’s take this one further: The decked-over area likely has a hatch on its inboard end. This would be the engine compartment, and there may be no bilge under it, so that space would be self-bailing. I’m guessing there is a V-type reversing reduction gear, so the engine output is on the forward side, angled slightly downward, and the propeller shaft comes out of the gear heading aft under the engine and out the stuffing box. Mr. Lafferty has most of the story exactly right about the second ‘Inspector II’, which was built by NYYL&E in 1925 as ‘Onwego’. This vessel, renamed ‘Dawn II’, was ultimately sunk near Key West, Florida on May 6, 1980 by the USCG, who cited her dangerously decrepit condition and preemptively scuttled the craft to preclude her participation in the Mariel Boatlift. I would assume the sinking on July 29 was of another similar boat. George Bourne commissioned NYYL&E to build him a second, much larger ‘Onwego’, which was launched in 1932. A bit more research reveals that Mr. George Bourne was a very satisfied customer of New York Yacht, Launch & Engine Company. 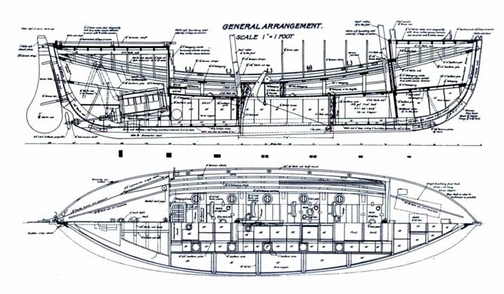 They built him a total of THREE boats within one decade, all named ‘Onwego’: 72′ in 1925, 85′ in 1927 and 120′ in 1931.